Retired Marine crossing guard: Pennsylvania man steps up. …when the school year started on Monday, Alston, who is a chaplain for the Lancaster County Marine Corps League, headed to the school and saw that they didn’t have a crossing guard at one busy intersection. Because he had been at a funeral service that day, Alston was still wearing his marine uniform. 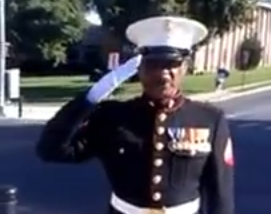 “I had my uniform on, and I thought, ‘Wouldn’t it be a golden opportunity for the students to see a marine help them cross the street?’” the former truck driver said. Every day since then, Alston has gone to the school in his uniform in the mornings and afternoons when he can to walk the children safely across the street. The chief of police tells ABC News he supports Alston’s efforts. A school representative says another group of community volunteers helps guide students through a local park. Here’s video of Alston in action. Go out and do something nice for someone today!